Typically, patients who present for fat grafting to the hands complain that their hands make them appear older than their faces would suggest. They point to the back of their hands, where the veins and tendons have become more prominent and request a fuller, more youthful appearance. 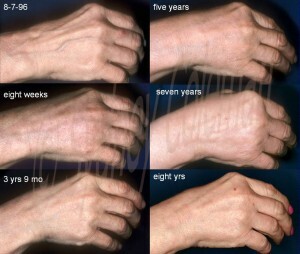 Individuals with noticeable loss of subcutaneous fullness from the back hand and those with thinning skin, which shows the underlying tendons and veins, are the best candidates for hand rejuvenation with fat grafts. Also those with arthritis or wasting of the hand are also great candidates for this procedure. The goal is always to create a healthier appearance. Hands are one of the most visible unclothed areas of the human body and also one of the first areas to show visible signs of aging. The back of the normal hand is not a repository of fat and the attractive young hand is full, not fat. The key to the successful rejuvenation of the aging hand is to create an integrated layer of fat grafts over the back of the hand that makes the skin look and feel thicker with a slight youthful fullness. The back of an attractive, healthy appearing hand has a slight fullness that obscures veins and tendons but does not hide them. 52 year old with wasting of the hand accompanied by enlarging of the joints by arthritis. 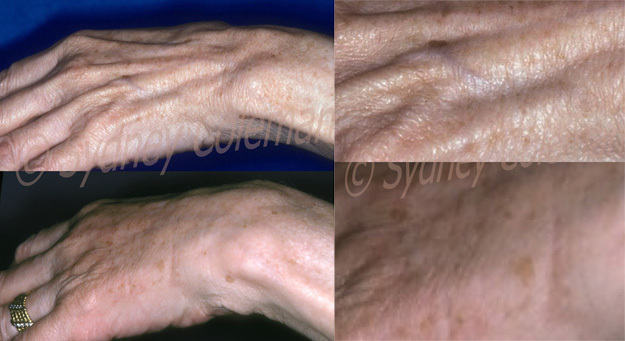 Appearance one year after diffuse infiltration of fat to the back of the hands from the wrist to the fingers (lower photos). Closeup on right of center of hand shows the change in texture possible with fat grafting. 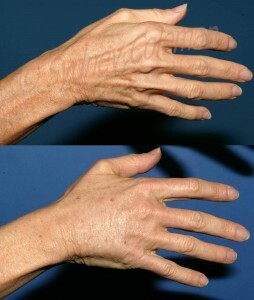 The simple, reliable Coleman technique of transplanting fat to the back of the hand can be used to achieve long-lasting rejuvenation. With this approach, restoring a slight fullness to atrophic subcutaneous tissues initially rejuvenates the hand by causing a physical barrier, which masks the exposed tendons and veins. Then over the following months and even years, there is an apparent thickening of the skin with a gradual increase in the quality of the hand skin. As the fullness of the hand is lost with advancing age, the joints become more isolated. Adding a slight fullness to the hand makes the joints look smaller and thereby restores a healthier and more youthful proportion of the joints to the rest of the hand. The procedure involves about 7 or 8 tiny entrance sites around the back of the hand through which the fat is woven to create a smooth uniform layer of fatty tissue with stem cells present. 5 years after one fat grafting procedure to the back of the hand.